Pamukkale,is a natural site and attraction in south-western Turkey in the Denizli Province.Pamukkale is located in Aegean region,in the River Menderes valley,which enjoys a temperate climate over the greater part of the year. The ancient city of Hierapolis was built on top of the white"castle"which is in total about 2700 meters long and 160m high.It can be seen from the hills on the opposite side of the valley in the town of Denizli,20 km away. 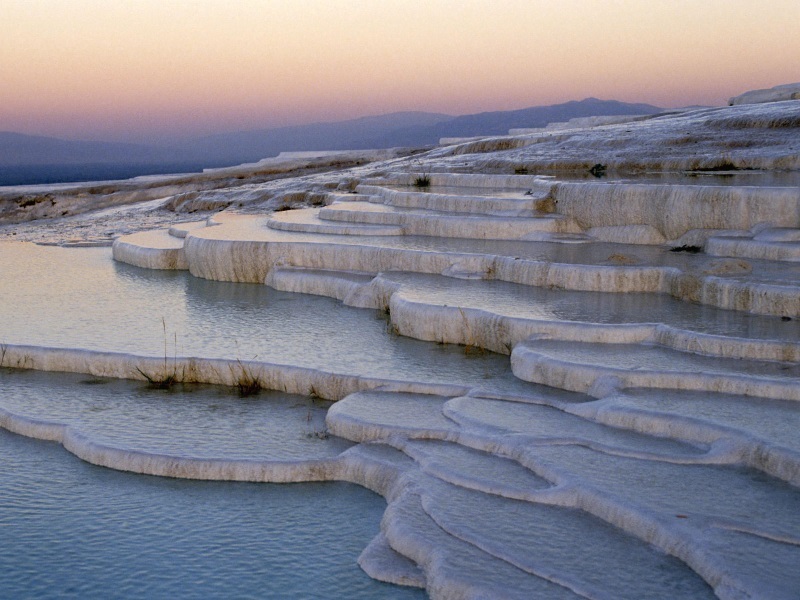 The tectonic movements that took place in the fault depression of the Menderes river basin triggered frequent earthquakes,and gave rise to the emergence of a number of very hot springs.The water from one of these springs,with its large mineral content — chalk in particular — created Pamukkale. Apart from some radioactive material,the water contains large amounts of hydrogen carbonate and calcium,which leads to the precipitation of calcium bi-carbonate.Every second 250 liters of hot water arises from this spring,precipitating 2.20 grams of chalk per liter of water or 0.55 kilograms of chalk every second.In the course of time some sources dried up because of earthquakes,while new ones arose in the neighbourhood. The effect of this natural phenomenon has left thick white layers of limestone and travertine cascading down the mountain slope resembling a frozen waterfall.One type of these formations consists of crescent-shaped travertine terraces with a shallow layer of water,lying in a step-like arrangement down the upper one-third of the slope,with the steps ranging from 1m to 6 meters in height.The other form consists of stalactites,propping up and connecting these terraces. The oldest of these rocks is crystalline marble,quartzites and schists.These date back to the Pliocene period,while the top layer belongs to the Quaternary.Fresh deposits of calcium carbonate give the site a dazzling white look. These sources were well-known in the Antiquity.They were described by the Roman architect Vitruvius. The Phrygian Greeks built Hierapolis on top of the hill.They ascribed medical properties to the spring water,bestowed by the gods,especially Asklepios and his daughter Hygieia,under the protection of Apollo. Pamukkale is a tourist attraction.It is recognized as a World Heritage Sites together with Hierapolis. A few other places in the world resemble it, including the Mammoth Hot Springs in the USA and Huanglong in Sichuan Province of China (another UNESCO World Heritage Site). Hierapolis-Pamukkale was made a World Heritage Site in 1988. Before the World Heritage designation,Pamukkale went unprotected for decades in the late 20th century and hotels were built on top of the site, destroying parts of the remains of Hierapolis.Hot water from the springs was taken to fill the hotel pools and the waste water was spilled over the monument itself,turning it brownish.A tarmac road ramp was built into the main part.People walked around with shoes,washed themselves with soap and shampoo in the pools and rode bikes and motorbikes up and down the slopes. By the time UNESCO turned its attention to Pamukkale,the site was losing its attraction.Officials made attempts to restore the site.The hotels were demolished,and the road ramp was covered with artificial pools which today are accessible to bare-footed tourists,unlike most other parts of the site.A small trench was carved along the outside of the ramp to collect the water and prevent it from spilling.The brownish parts have been left to be bleached by the sun without being covered by water to diminish the problem.Therefore many pools are empty.Others parts are covered with water for an hour or two, on a rotating schedule. The underground volcanic activity which causes the hot springs also forced carbon dioxide into a cave.The result was called the Plutonium meaning place of the god,Pluto.Tadpoles can be found in the pools.